Within 24 hours, a human cell can divide into two daughter cells that are identical to the original. This cell cycle includes growth of the cell, duplication of the DNA and division of the chromosomes and cell contents. The stages of the cycle -- which occur in both plants and animals -- are called interphase, mitosis and cytokinesis. Kinetochore and nonkinetochore -- also known as interpolar -- microtubules play an important role in the separation of chromosomes and the formation of daughter cells. These microscopic structures are both made from subunits called tubulin, but they have different functions during cell division. When a cell enters mitosis, a microtubule-based structure called a spindle forms with two poles at either end of the enlarged cell. The chromosomes align along the center of the spindle prior to separation of the chromatids -- half of the duplicated chromosomes. Kinetochore microtubules extend from the spindle poles toward the center of the cell and attach to the chromatids at a structure called the kinetochore. The nonkinetochore microtubules also extend from the spindle toward the center of the cell, but they do not attach to the chromatids. Instead they overlap at the center of the spindle. During late prophase -- one of the phases of mitosis -- the plate-like kinetochore forms on the duplicated chromosomes. Each chromosome has two kinetochores -- one for each identical sister chromatid -- attached to kinetochore microtubules from opposite poles. Kinetochore microtubules attached to the kinetochore cause the chromosomes to line up along the middle of the spindle. Nonkinetochore microtubules extend from the spindle poles toward the center and overlap with each other. By metaphase, the chromosomes, attached by the kinetochore microtubules to the spindle poles, are lined up along the center of the spindle -- the metaphase plate. The kinetochores of the sister chromatids face the opposite poles. The spindle -- consisting of both kinetochore and nonkinetochore microtubules -- is fully formed. During the first part of anaphase, the chromosomes separate into sister chromatids. These then move toward the spindle poles as the kinetochore microtubules shorten. Later during anaphase, the nonkinetochore microtubules grow longer and slide past each other, causing the spindle poles to move further apart. This separation of the spindle poles prepares the cell for division of the cytoplasm -- the cell contents. The nonkinetochore microtubules continue to elongate the cell. The chromosomes condense and the nucleus reforms around them. The kinetochore and nonkinetochore microtubules of the spindle are then replaced by others that are present in the cell between cell division. 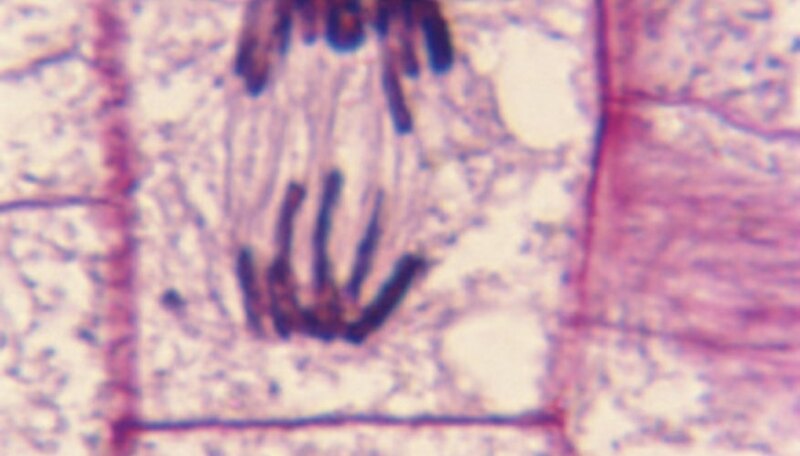 A contractile ring -- like a belt -- forms around the middle of the cell and divides the cell into two daughter cells. Radcliffe, Shawn. "The Differences Between Kinetochore & Nonkinetochore." Sciencing, https://sciencing.com/differences-between-kinetochore-nonkinetochore-8632149.html. 25 April 2017.